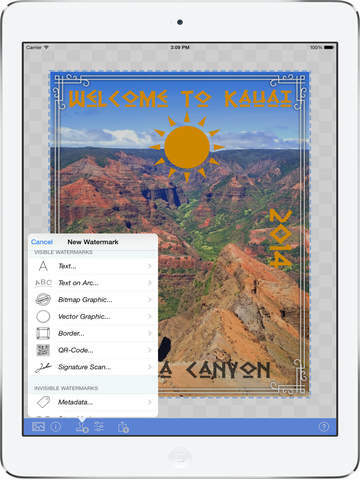 Essential Watermark & Watermarking App for Professional and Beginning Photographers. Watermarks, once added to a photo or video, display that it was created and is owned by you. Easily, secure and protect your photos by signing them with 9 visible and 2 invisible = 11 watermark types. These days any unique photo can suddenly go viral and lose all connection to it's owner/creator. A watermark subtly displays, no matter where your photo goes, that it's your property and can provide a link to your website. 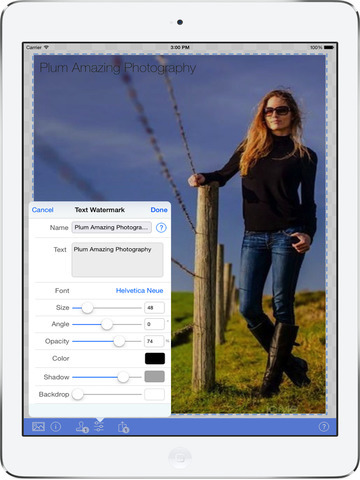 A new breed of iOS 9 app that works as a standalone app or photo editing extension. 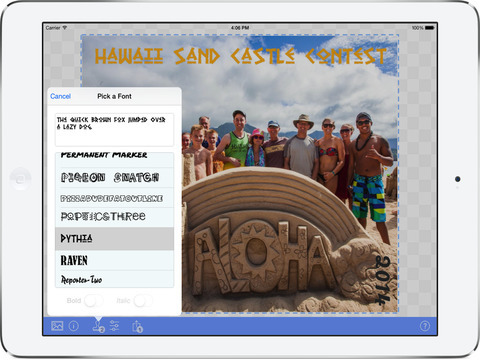 As an extension it can be used and hosted within Apple's Photos app. Watermarking can also be used to style and customize your photos by adding your signature, email, url, metadata, QR code, text on an arc, borders, a personal message, vector graphics, resizing and/or custom filters. * has iW•Cloud for backup & sharing.of watermarks online. * Share at full res to Facebook, Instagram, Twitter, Camera Album, Clipboard or Email, Tumblr, Flickr, Pineterest, Evernote, etc. Subscriptions for additional space for online backup & sharing of watermarks is available via iW•Cloud. 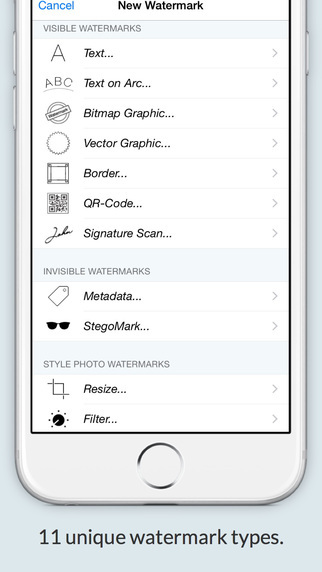 An in app purchase is not required to use iWatermark+. Q:Will it work with Canon, Sony, Nikon, Fuji, Olympus SLR photos? A:Yes, depending on the memory limitations of your iOS hardware. 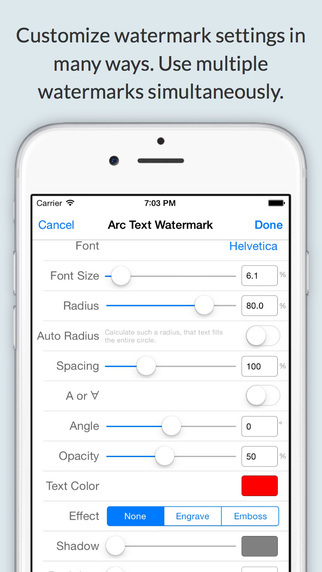 + [Tweak] Typed in Font size value can now be > 100%. 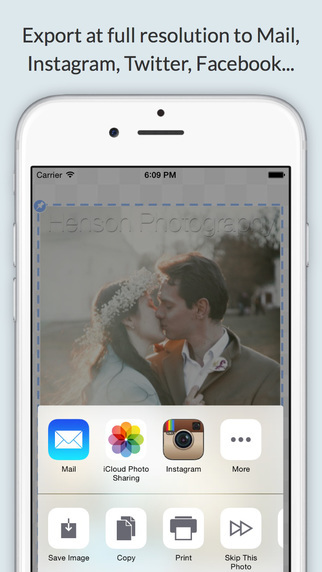 + [Added] Get "photo creation date" from metadata [EXIF], instead of one provided by "photo picker". + [Added] Thanks to user Andrew Crossley for pointing this issue out. When exporting watermarked file, set its "creation date" to the one taken from file's metadata [EXIF]. That way, when exported to Finder, the sorting order remains correct. In other words, watermarked file's date will be equal to that of its original file's. This behavior is on by default but can be turned off in Preferences, for both "creation" and "modification" file dates separately. + [Add] Action extension now allows using iWatermark+ as action extension within photo editing apps. + [FIX] Metadata Keywords are now exported separately not as single string. against most of the Watermark Type cells, giving a little desc. of each watermark type. + [Fix] Resurrect "video preview frame time" in Video Info panel. 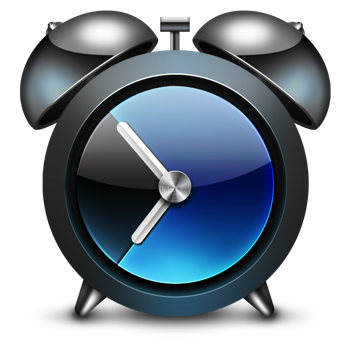 Moved the "frame time" label above the slider, so that it can be seen while dragging the slider [not covered by user's finger]. 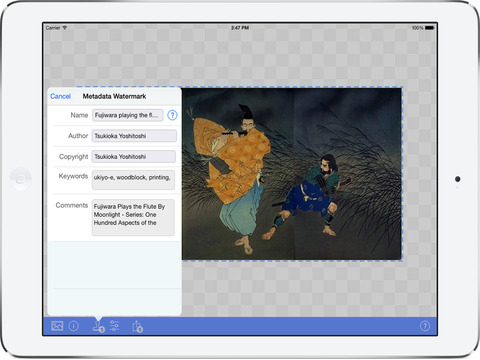 + [Added] When browsing a Cloud watermark, one can now touch its Album name to open that album for browsing. + [Fix] Photos extensions. Much better with memory. + [Fix] Cloud Account Page: limit minimal timeout value. + [Added] Cloud Account Page: Leftmost toolbar button depends on a selected page: It's either "Logout", "Manage Subscriptions" or "Reset Settings". + [Fix] Cloud: fix timeout/cancelling related bugs. + [Added] "Watermark-on-Cloid" page: some watermark parent albums can be browsed into. If that's the case -- make album name appear blue. Touching one opens a "Cloud Album Browser" page. + [Fix] "Watermark-on-Cloud" Description text editor. + [Fix] Fixed multi-line text watermarks losing lines on load. + [Fix] Fixed issues in Signature Watermark's. + [Tweak] "Create with iWatermark+ Free" banner made larger, brighter; fixed scale of its "dashed line" on watermarked photos. + Cloud Login: auto-populate Name field in Register Account page with a "name" part of Login Id's "[email protected]". That speeds up a registration process. 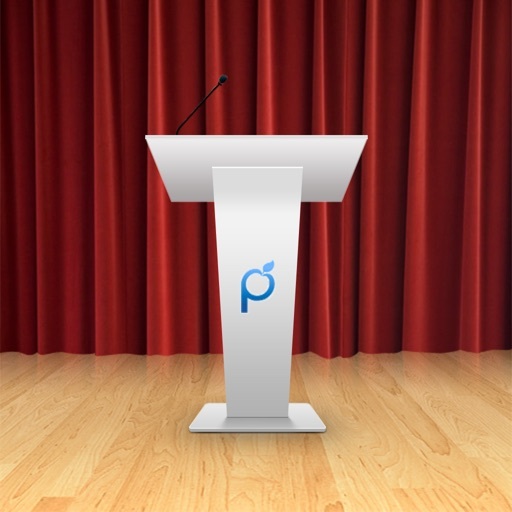 Thanks to all users for all the suggestions and feedback.